OXFORD, Miss. – A highly selective $750,000 grant from the U.S. Department of Energy’s Office of Science will continue funding a University of Mississippi professor’s research into improving solar energy technologies. 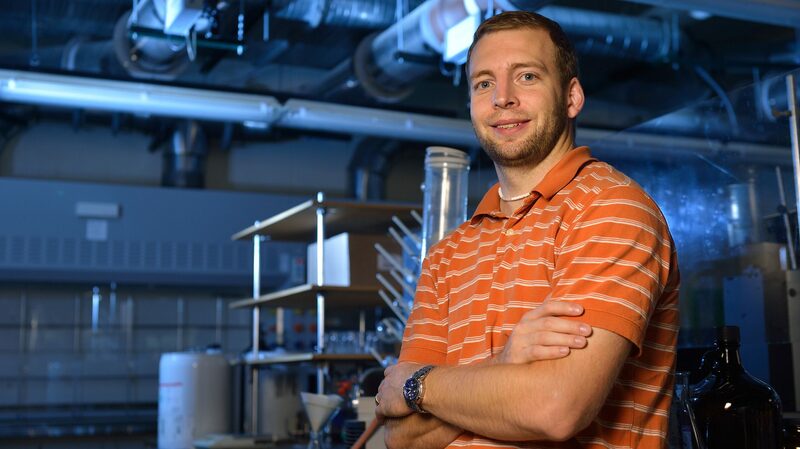 Jared Delcamp, an assistant professor of chemistry and biochemistry, has been awarded the grant funding through the department’s prestigious Early Career Research Program. The award will support Delcamp, along with a post-doctoral student and a graduate student, in their research to better understand how to use high-energy visible light efficiently in relation to solar energy. Delcamp was among 84 scientists this year from across the nation – including 54 university researchers – to receive a research grant through the program, which is in its ninth year. “It is very exciting to me to get an Early Career Research award,” said Delcamp, who joined the UM faculty in 2013. “The division it is coming from is full of the best solar energy researchers in the U.S. The Early Career Research Program is designed to develop the individual research programs of outstanding scientists at universities and Department of Energy national laboratories early in their careers and stimulate research careers in the disciplines supported by the department’s Office of Science. No more than 10 years can have passed between the year the principal investigator’s Ph.D. was awarded and the year of the deadline for the proposal. A native of Monticello, Kentucky, Delcamp graduated from the University of Illinois at Urbana-Champaign with his doctorate in chemistry in 2010. Delcamp is the first UM faculty member to receive the award. Delcamp runs the Delcamp Group, a renewable energy research lab at the university. The lab focuses on using sunlight to separate charges across two materials, Delcamp said. With sunlight energy being wasted in the visible region just after the ultraviolet region in a lot of solar technologies, Delcamp’s research is studying ways to stop this loss. New discoveries in this field potentially could improve dramatically technologies used in the fields of solar cells, direct solar-to-fuel devices and solar-powered batteries. Since joining the Ole Miss faculty, Delcamp has won several awards and grants, including a National Science Foundation CAREER Award in 2015, several NSF awards and a NASA Research Infrastructure Development award. In 2017, Delcamp received a Michael L. Edmonds New Scholar Award, presented annually to junior faculty at UM demonstrating exemplary performance in research, scholarship and/or creative achievement. The funding allows Delcamp to focus on training the best scientists possible while making important discoveries that are being recognized internationally, he said. “We have been atypically successful in terms of funding,” Delcamp said. “We use our funding very carefully to ensure important experiments are being done and science is being progressed responsibly. Delcamp’s project, titled “Controlling Interfacial Charge Separation Energetics and Kinetics,” is funded through DOE grant No. DE-SC0019131, which runs through Aug. 31, 2023.